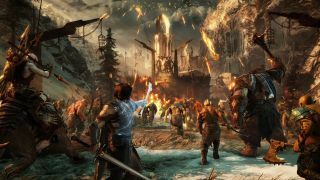 When it was first released back in September 2017, Middle-earth: Shadow of War was one of a handful of games involved in a growing furore over microtransactions. But now, more than six months after its release, they’re going to be removed. The news was announced by the game’s developer, Monolith, on a community forum post in which it confirmed that purchasable Gold, War Chests and the Market will be permanently removed from the game via a series of free updates. This isn’t happening instantly - Monolith is rolling out the changes steadily so that players invested in the microtransactions system aren’t too heavily impacted. By May 8, players will no longer have the option to buy any Gold in the game. On July 17, Gold, War Chests and the Market will be removed. If you still have any purchased in-game Gold left on July 17 it’ll be converted to a Gold Loot Chests with 150 Gold securing one Loot Chest. If you have less than 150 Gold, you’ll just get one Gold Loot Chest. Though these changes are welcome, it’s somewhat surprising that the microstransaction removal is happening now, given player reservations were expressed even before the game’s release. Regardless, the news is unlikely to be taken badly. Monolith has provided more details on its plans in an official FAQ and said that other updates will be coming further down the line which will include gameplay improvements, skill tree additions and progression updates.